Rheumatic fever and RHD is still a major cause for cardio vascular morbidity and mortality in India .It seems , improving quality of life has little impact on the incidence . (We could realise this as we sit in the cardiology OPD of a 200 year old hospital !) There is no country wide data on the true prevalence . Our understanding of rheumatic heart disease is based on isolated studies on localized populations . Of late , cardiology resources in our country is diverted towards much glamorous CAD the poor continue to suffer with RHD. Just Imagine many hospitals indulge in 1000s of PTCA every year but hardly do a hand full of PTMCs. In this scenario , it is a pleasant surprise to find a wonderful review article on RHD from the two pioneers , in lesser known medical journal IJMR . Especially heartening is the fact , it is a collective effort from two distant regions of India ( Kochi from down south and New Delhi In the north) . While politicians keep the divide , it is a great work of the authors , which would help youngsters who would like to go on a national mission on eradication of RHD. .
Mitral regurgitation is one of the most common lesion of rheumatic heart disease .Mechanism of MR in acute rheumatic fever is different from chronic rheumatic heart disease. Acute LV dilatation in fulminant cardiac failure. * The direction and the width of MR jet is related to the mechanism of MR. If there is chordal shortening due to fibrosis of mitral valve co -optation plane is altered . The degree of chordal shortening , pap muscle fibrosis (rare) symmetry of chordal involvement determine the MR. This could be more common than we realise. It can be true or pseudo. True prolapse occur due to chordal weakening or lengthening . It is rare to see a perfect central jet in RHD . presence of Central jet is a good sign to consider mitral valve repair. 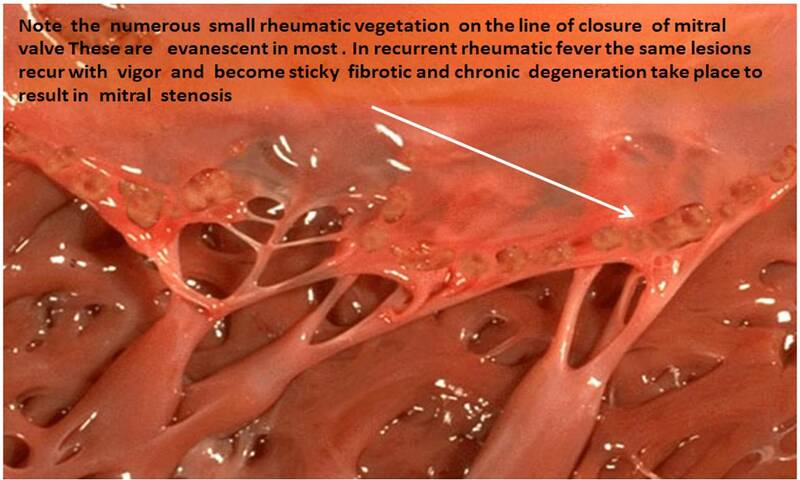 Even though rheumatic fever is a classical example for pan-carditis , it is surprising to note (Of course fortunately !) how myocardium escapes in the chronic process of RHD. Is it really true , myocardium do not get involved in chronic RHD ? * Even in acute rheumatic fever with fulminant carditis , myocardial involvement is disputed by many ! . My belief is , there will definitely a subset in both acute and chronic forms of RHD , in which myocardium gets involved . In our institute LV dysfunction associated with RHD occur in up to 5 % of RHD population . 1. Is there a potentially reversible component in pathology so that we can wait before intervention ? I have seen children referred for mitral valve replacement due to severe MR . In due course MR regress by the time they reach the tertiary center (waiting period included ) At least one child i remember, the MV surgery was canceled due to spontaneous regression MR. It was later found the MR was more of valve inflammation than degeneration . * Always think about the possibility of reversible rheumatic MR in every severe isolated MR in children (Do not apply this rule in adults or in combined MS or MR ) Do a ESR, ASO and start an intensive anti inflammatory therapy , aspirin with strict penicillin prophylaxis .With this one can definitely postpone the surgery in few cases and may avoid it altogether ! If we could delineate the exact pathology of MR it will facilitate the repair . Annular reduction and neo chordae etc . Of course ,the surgery could be very difficult in scarred mitral valves , Dr Sampath kumar *of AIIMS New delhi , India would feel other wise ! How is balloon/Surgery related injury different from rheumatic process ? Why is rheumatic mitral vale prone for bacterial infection ? What is the relationship between extent of aortic valve involvement and degree of mitral valve involvement in RHD ? Rheumatic heart disease is rampant in India. Advanced forms of mitral stenosis are still common. 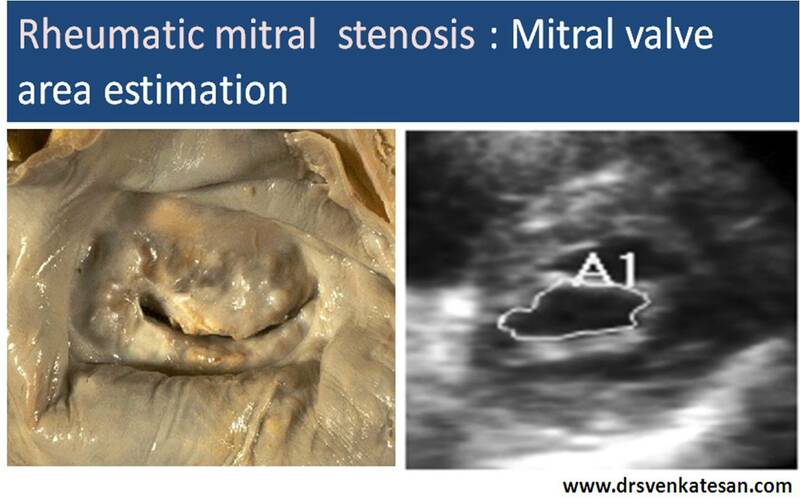 Critical mitral stenosis with LA clot formation is often seen. But here is a women in late twenties presenting for the first time with syncope . And what you see inside is not a fiction . . .
Left atrial clot occupying the whole cavity ! Where is the blood bound for left ventricle ? Luckily the clot is so big and MVO is less than 1 sq cm. It is highly unlikely the LA clot can negotiate the orifice. Small fragments can dislodge .This patient developed syncope whenever she bends and lie down at a particular position. What needs to be done in this patient ? Can it be lysed ? No ,Emergency surgery is required with concomitant mitral valvotomy or mitral valve replacement. Is there a temporary aortic filter available to prevent systemic emboli from heart ? Distal protection devices are available only temporarily in the coronaries and carotids during interventional procedures.There is no aortic protection devices for LA,LV clots in high risk patients . When IVC filters are used block a potential pulmonary clot why not aortic filters for preventing systemic emboli ? Why we have not thought about this . . . is surprising . May be intensive anti coagulation is as effective . A young women with Rheumatic heart disease . When do you call a left atrium as giant ? When it is referred to as Aneurysmal dilatation ? It is all semantics. Whenever LA becomes more than 6 cm , at least in two diameters many prefer to call it giant . In India , 6 cm LA is such a common finding , we have kept a cut off at an arbitrary 9 cm . What factors determine a LA to dilate like a balloon ? The exact mechanism is not known.It could be the intrinsic weakness of LA wall , as very few with RHD develop this. Many LAs resists dilatation even in the midst of extreme LA pressure. But , it is a well-known fact , mitral regurgitation provokes greater LA dilatation than MS alone .This implies volumetrics play a major role than pressure dynamics in determining LA size. Acuteness of hemodynamic insult is inversely proportional to LA size. By the way, what is the purpose of recognizing the LA as Aneurysmal ? In plain X -ray chest , LA may form the right heart border over shooting the RA. When LA becomes huge , there is a chance for mechanical complications like dysphagia, phrenic nerve , bronchial compression etc . Giant LA invariably increases the chance of LA clot. Atrial fibrillation , a usual accompaniment of giant LA , is often refractory . There is no purpose to convert to sinus rhythm . In fact , one should not attempt this. There was a time when surgical incisions ,corridors , mazes were quiet popular.Now it is believed all these are adding further injury to the ill-fated LA .Electro-physiologists should be restrained . Pulmonary vein ablation should never be attempted in such cases as the focus of AF is elsewhere . During PTMC LA size can be an issue as the plane of IAS is distorted and make things difficult for septal puncture . Further the balloon , guidewire may often slip back into RA . Does the LA size regress after surgery ? In many it does regress , in as many it doesn’t. We have seen giant LAs continuing to trouble the patient even after a successful mitral valve replacement. 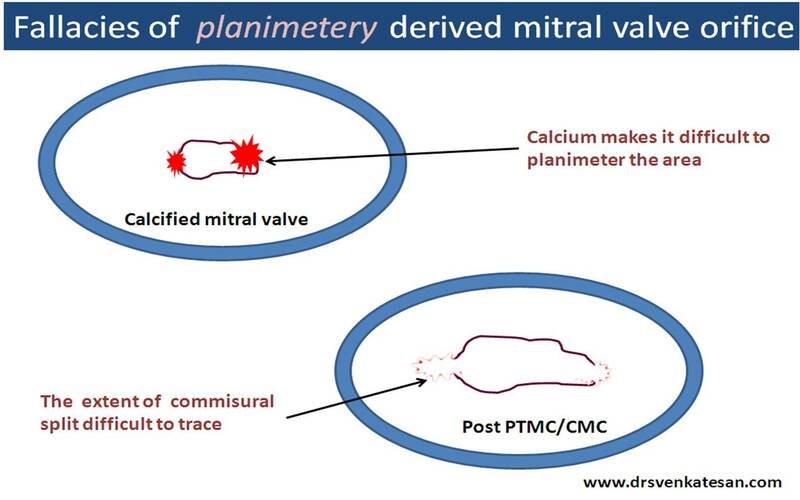 When does planimetery errs in estimating mitral valve orifice ? Planimetery is the age old method to measure the mitral valve area( MVA) by echocardiography. Optimal gain setting becomes important .There is significant inter and intra observer variability. Shape of the orifice is not constant ( MVO is funnel like) . Narrowest diameter is usually measured. Planimetery is a purely an anatomical orifice,while blood flows through both primary and secondary mitral orifices .Sub valvular fusion makes secondary MVO the narrowest point . Measuring it becomes difficult as it has no defintion of border. Gross errors possible in calcified valve. How to improve the accuracy of planimetery ? Color Doppler aided 2D planimetery . This can improve some of the limitations , as it provides a hemodynamic MVO(Some what physiological ) Of course , pressure halftime derived MVO is purely a physiological orifice . Advantages and disadvantages of Pressure half time derived MVO will be posted soon. 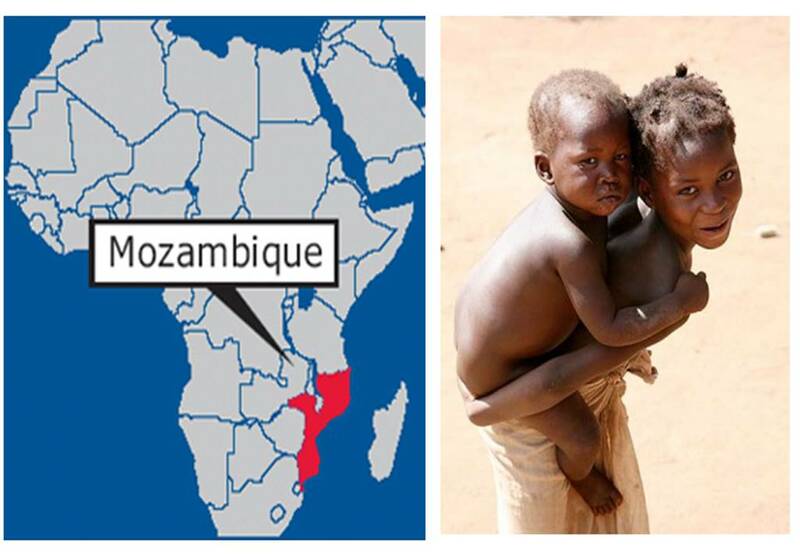 Great cardiology papers come from the “Dense forests” of Mozambique ! RHD is the scourge of mankind . While a part of the world is suffering from glamorous lifestyle disease ,a significant population (The country I live – India , included) is suffering due to “lack of any style” in their life ! exposed to primitive streptococcal infections and end up in deadly destructive heart valve disease . While , the privileged cardiologists make merry in cath labs , a few toil in the deep sub Sahara forests and the tropics of Cambodia to bring some sense and balance to cardiology literature. Mankind will benefit much more these committed souls* than the pseudo-research that is happening world wide ! Of course , we should thank the NEJM to publish such precious articles ! Echocardiography , if used widely in general population ( more specifically in children) can identify rheumatic fever early with high degree of precision .With penicillin prophylaxis we can reduce the RHD burden of our planet significantly. Will the WHO be proactive ? If a portable echo costing few thousand dolors can save millions of life , let the WHO the bring an ordinance to supply (liberally ) manpower and machines to all those poor countries which lack in basic health service , but infested with free supply of deadly land mines , outsourced arms and ammunition ! This study was performed in Maputo Heart Institute Mozambique , and Cambodia . * Three cheers to Eloi Marijon, M.D., Phalla Ou, M.D., David S. Celermaje . Travel online to Africa : A journey into human side of cardiology . . .
How do you identify left atrial enlargement in X ray Chest ? Left atrium can enlarge in multiple directions.Generally it dilates in the path of least resistance. It is believed left atrial appendage enlargement occur early . LAA enlargemnet seen as a fullness beneath the pulmonary artery shadow. It may be the earliest finding of LAE in X ray. ( This may appear as straight left heart border , as in classical mitral stenosis where MPA is also enlarged). 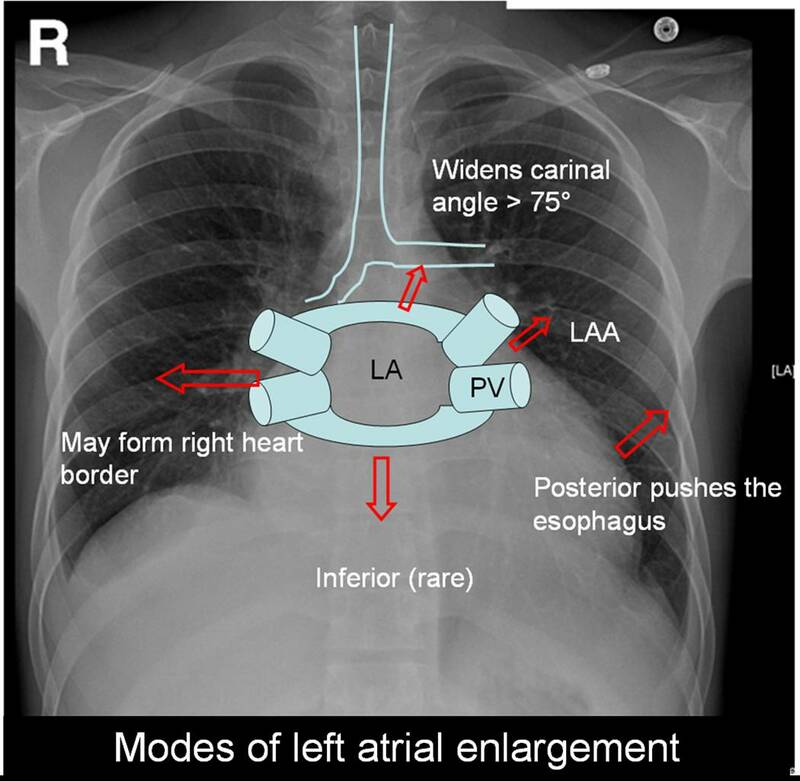 The LAA enlargement is not necessarily in in proportion with LAE. LA could also enlarge posteriorly by pushing the esophagus towards the spine.This is visible only in barium swallow. Then LA can enlarge either to left or right ( Usually towards right) and reach the right heart border or over shoot it and form the right heart border by itself.This occurs very late in the course. The other direction LA goes on to enlarge is superiorly. When LA enlarges superiorly it hits on the left main bronchus and lifts it.This is measured by the widened subcarinal angle which is normally less than 75 degrees. 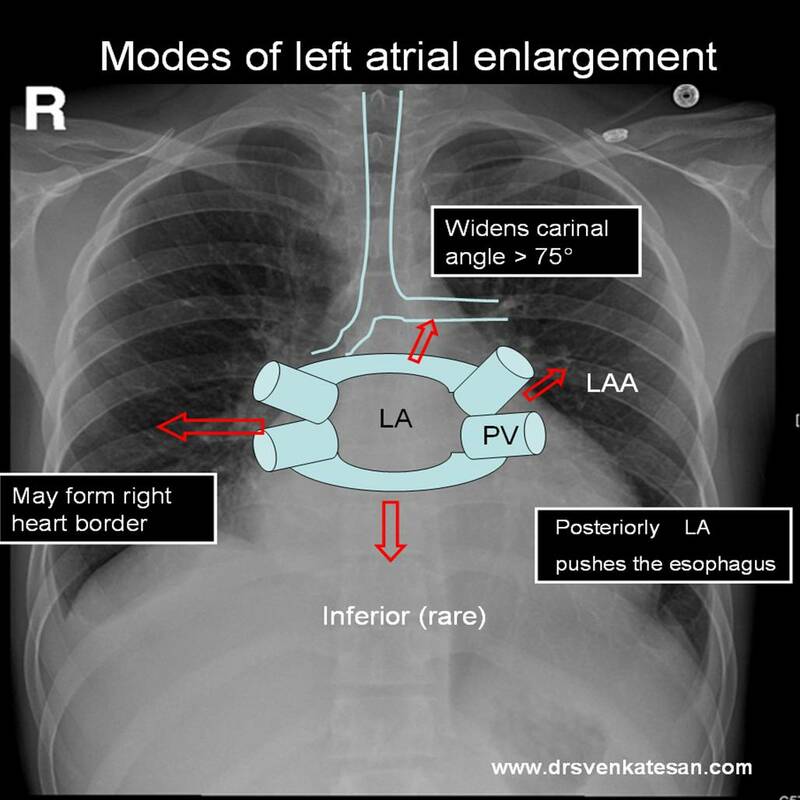 LA can enlarge anteriorly sometimes , but it is resisted by right ventricle but rarely right ventricle yields to the LA push and produce a left parasternal lift which could be mistaken for RV enlargement. Inferior enlargement can not happen in a significant way as it is limited by the AV groove and strong fibrous skeleton. With the advent of echocardiography X ray assessment of LA is redundant . (Academic value and in fellows training programs).The upper limit of normal LA size is around 4.5cm. Rheumatic mitral stenosis, regurgitation. Gross enlargement up to 10 cms are common. Cardiomyopathy, especially restrictive where both atria enlarge. In all these conditions if atrial fibrillation occurs LA size increases further.